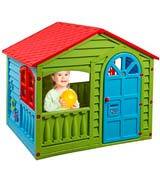 This wooden playhouse is truly durable and will be your kids' favourite toy for years to come. Moreover, wood is an eco-friendly material absolutely safe for children. Some parts might appear not too snug-fitting. 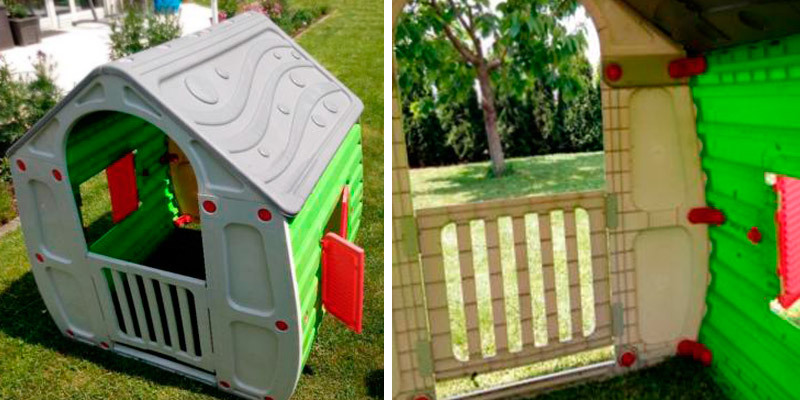 Waltnos have made a playhouse that your kid will definitely love. This little shelter is designed using the same materials as real buildings to let your child feel like a true landlord. Kids of all ages and genders love the bright and cheerful colours of the house, this composition of blue, green, and red looks really cute. Water leaks occur when it's raining. 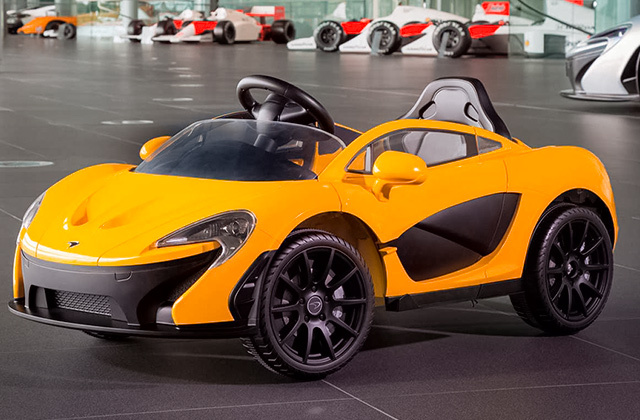 It is just the right pick for 2-years-old children. 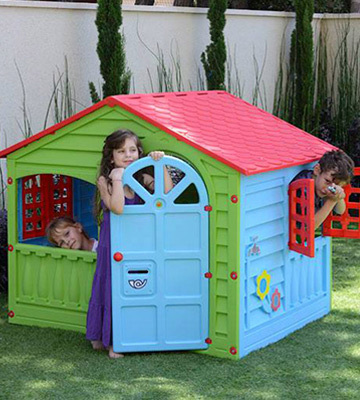 Your kid will find this playhouse their shelter, place for games, and favourite spot to gather with friends. Numerous windows and doors let the sunlight in, making this house really bright, therefore, a delight for children. There is a flag holder for little patriots. No flag in the package bundle. It takes just about 20 minutes to easily assemble the playhouse. 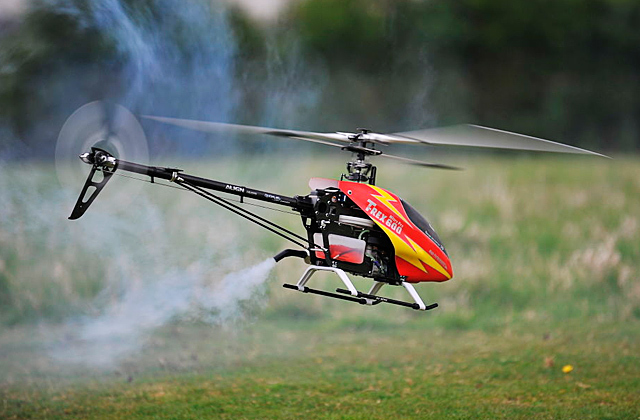 The construction is robust enough to withstand rough playing, whether you put it outdoors or indoors. A truly profound solution that has integrated elements for different games and entertainment, including benches, in the package bundle. Not spacious enough to fit a table inside. A wonderful solution to make your kids happy. 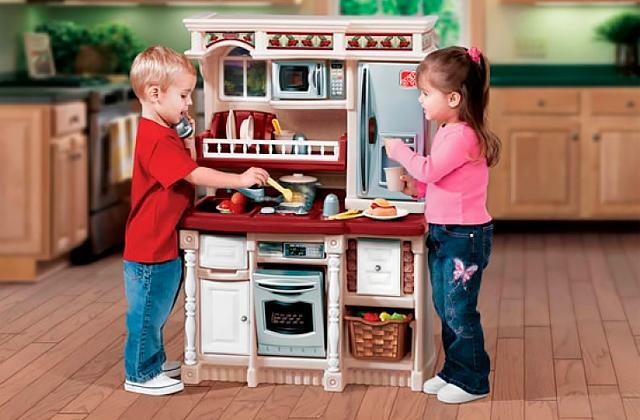 This house has a stable sturdy construction, numerous engaging elements for games, it is loved by children to no end. As compact as one can think of a wendy house. It is also lightweight to displace or carry it inside your real-size family house. Might be a bit wobbly. 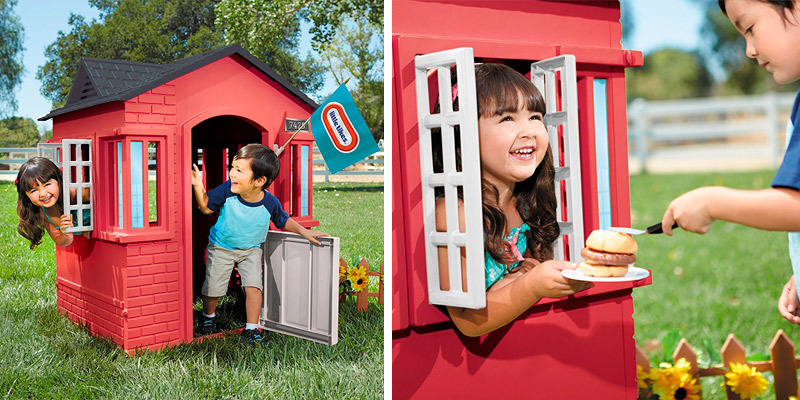 This playhouse is the right pick for your youngest and smallest. The construction of this house is absolutely safe and prevents any kind of hazard or possibility for you kid to get injured. And it is utterly easy to assemble. 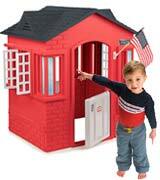 A wooden playhouse is a great idea if you want to give your child an opportunity to feel like a real house owner. This model uses sturdy and reliable materials and will become a good fixed option for your backyard since it is quite heavy (68 kg when assembled). It is also big enough to shelter your kids from the rain and the wind. 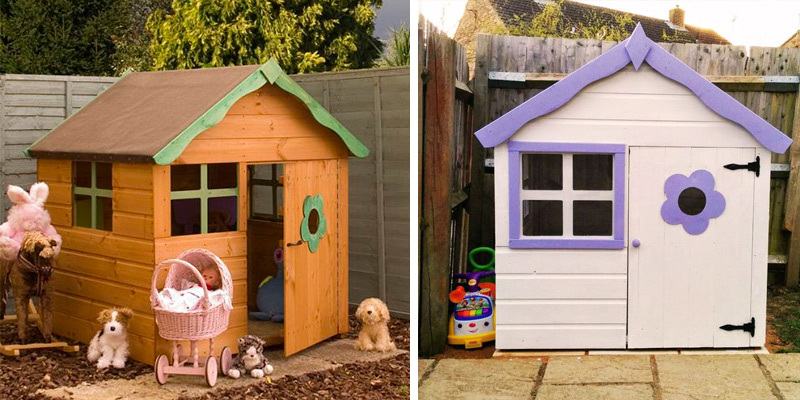 Although wooden playhouses are generally not easy to move, they are easier to revamp with a help of just a coat of paint. Moreover, they don't look like an enormous toy but resemble a more-or-less real cottage. Commonly, the dimensions of a ligneous house are also larger, letting your kids share the accommodation rather than fight over the precious space. Wood doesn't fade over time and lasts long if you maintain it properly. 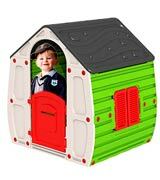 When purchased, this playhouse comes flat-packed as a DIY kit in large panels, and it also includes the instruction. The panels are not painted, enabling you to choose the suitable colours that will complement and decorate your backyard. The 12 mm planks are tongue-and-groove, meaning they can be easily joined together and interlocked to provide a sturdy waterproof construction. It also makes the assembly easier, although some consumers say that not all of the planks fit in perfectly, which is not a rare case for wood. Thus, you have an opportunity to customise the looks and construction of the playhouse. 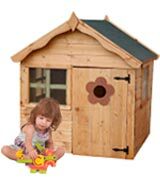 The 4x4 Honeypot Snug Wooden Playhouse is designed to be safe for 3-year old kids and is European Toy Safety Standards EN7 certified. Your children won't be catching any splinters since the cladding is plain and rounded to create a really smooth finish and prevent any injuries. When it comes to the windows, the manufacturers thought of a solution that is safer than traditional glass glazing: the windows are made of styrene, which is 100% shatterproof and safe for your kids. The door hinge is secure and, therefore, also safe unless a small bunch of children tries to hang on the door (which is, by the way, not an easy task to handle anyway as the kids will need to be quite tall). 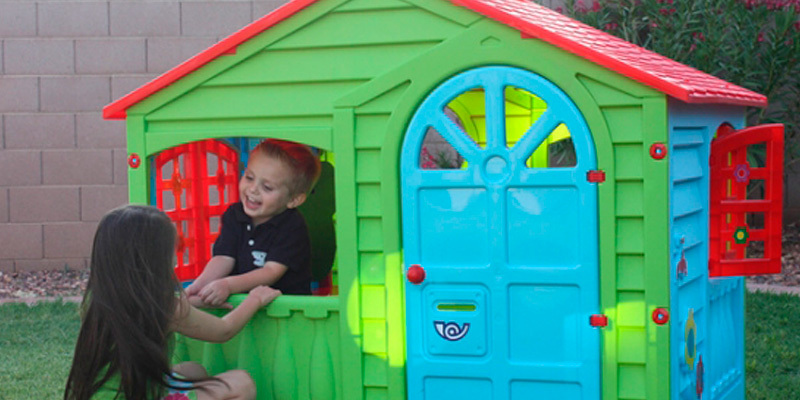 This playhouse is meant to be reliable play means for your kids. It comes with a 10-year anti-rot warranty that proves its sturdiness regardless of the weather conditions. The only thing you need to do in order to keep your warranty valid is use a high-quality wood preservative annually. 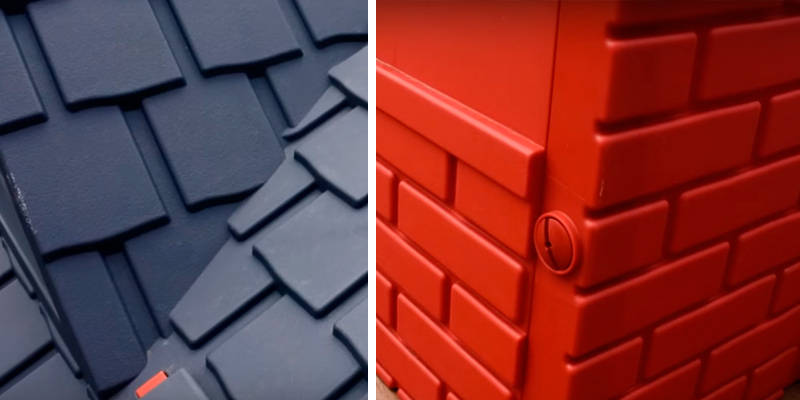 The roofing felt is covered with sand to create a waterproof barrier that helps prevent rot and wear. This particular playhouse does look like a big toy rather than a complicated building. 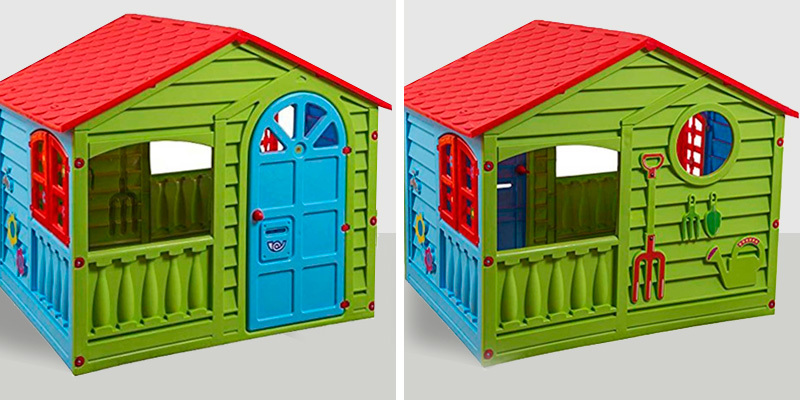 It was made to look that way on purpose since this model is intended for 2-years-old kids who can barely distinguish each of the house elements, yet they already appreciate bright colours and are curious for investigating the included exterior. This house is made of plastic, allowing you to put it both indoors and outdoors. It's not too big for a living room but it will take quite a lot of space in the nursery, leaving your backyard a better place to locate the playhouse. Polypropylene is a lightweight and reliable material that doesn't fear dust, dirt, and moisture. 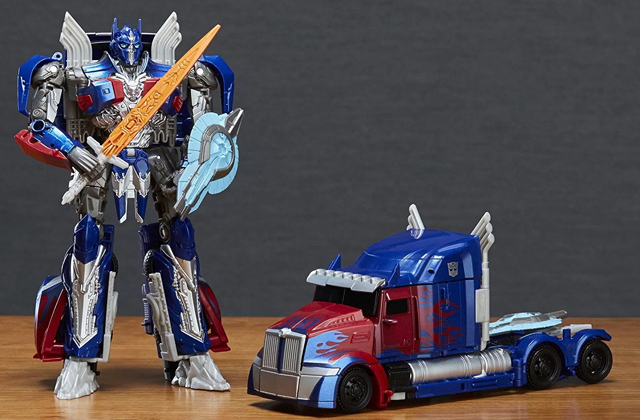 You will definitely appreciate these properties when it comes to cleaning this toy, and it will probably happen on a regular basis. 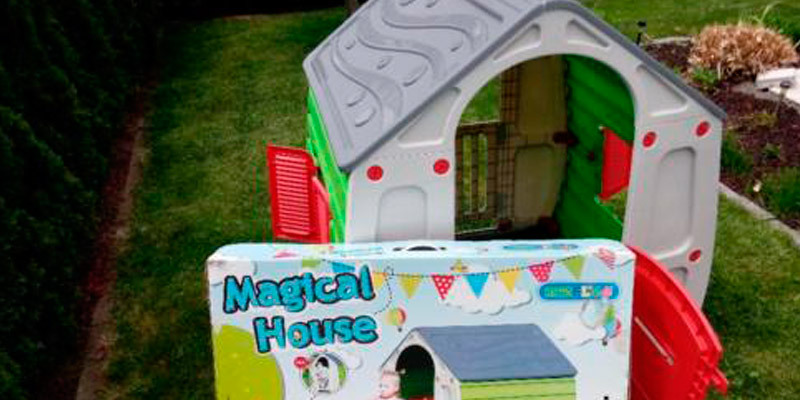 This playhouse is utterly easy to assemble using the instructions that come in the package bundle. Once ready, this bunch of plastic pieces becomes a solid construction which is not possible for children to fold or tilt. As you can see on the picture, it has plastic screws all the way through the roof and the walls to keep it all together. However, it takes some effort to fully disassemble the house. Nevertheless, you can use it as a storage for tons of toys or small appliances that don't fit into tiny closets during the winter season. Just make sure you don't put any harmful objects in the playhouse. 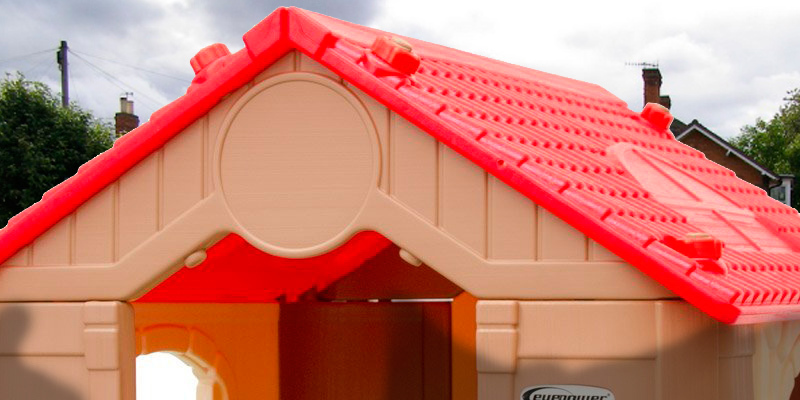 Unlike some wooden playhouses, this plastic model won't harm your children with splinters. 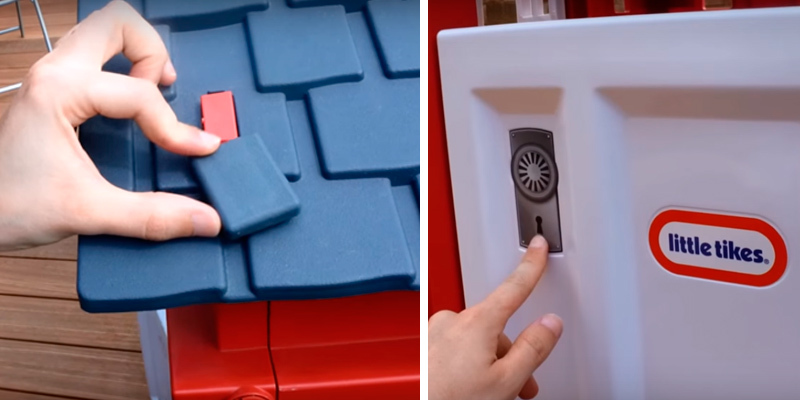 Kids can move around without thinking of what they may hit or accidentally touch (which they always do) thanks to the smooth and seamless polypropylene construction. Indeed, it has a sub-angular design, including the decorative exterior elements, door knob, and window shutters. Children simply can't accidentally hurt themselves with sharp object since there are none in this construction. This wendy house is capable of fitting in three kids without compromising the space for the engaging games. 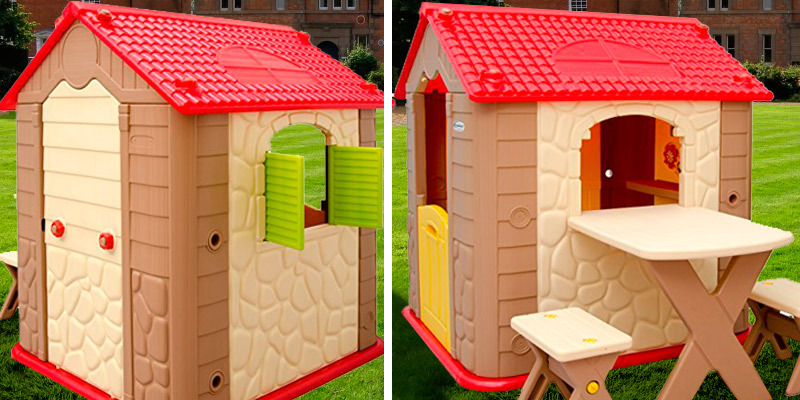 It has no floor, making it easier to move around and put on any surface with nothing to scratch in the playhouse. 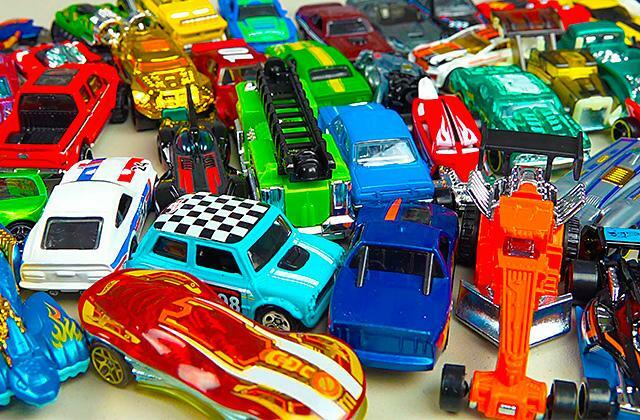 Children love stuff with opening and movable elements like a bonnet of a toy car. This house has both window shutters and a door openable to provide the best impression of a true house for the small chaps and young ladies. The inner space of this playhouse is perfect to fit a small table for board games. Also, there is no need to call the kids away from the outdoors when it's raining since the roof of this house is waterproof. Small and exquisite design details and ideas make this house look really accommodating and modern. It resembles a real full-size house thanks to the contemporary styling. Tiny details like bricks, arched doors, and modern looking windows make this model really outstanding. Some plastic houses look obnoxiously splashy, which is not the case here. 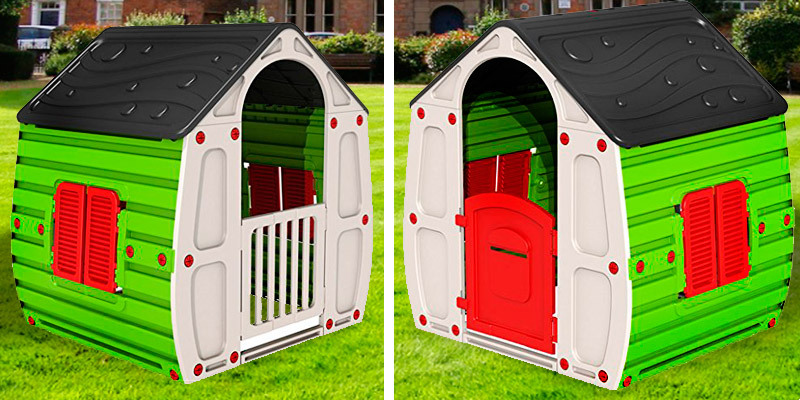 This wendy house comes with red walls and black roof — a great colour combination that doesn't bother kids or adults. Although the bricks are not real, this house does have a significant weight of 16 kg. And it may not be the heavy-duty plastic that lasts forever, but still a thick and reliable material. It takes only about 30 minutes to assemble this playhouse even with the help of your children, which doesn't often quickens the process. The plastic panels are attached using plastic screws which come with the house. There are some metal screws for the flag holder as well. The flag doesn't come with the package bundle but you can pick the flag or flags that will suit you the most. 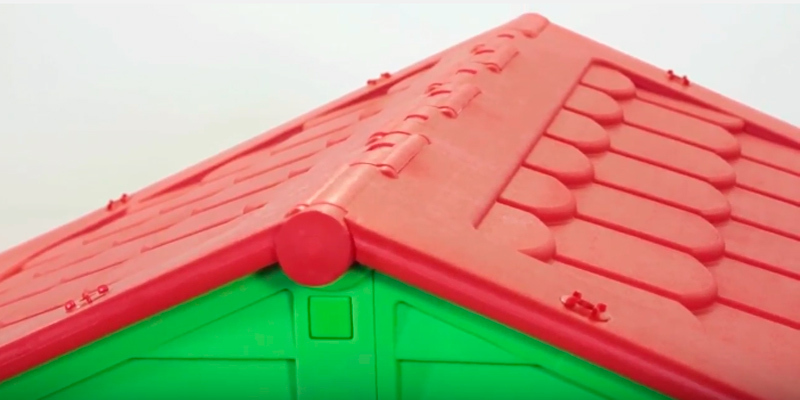 The roof of this wendy house has dormers with ridge vents. Thus, the shape of the roof becomes irregular, promoting the water runoff when it is raining. They also ensure more usable space inside the house. 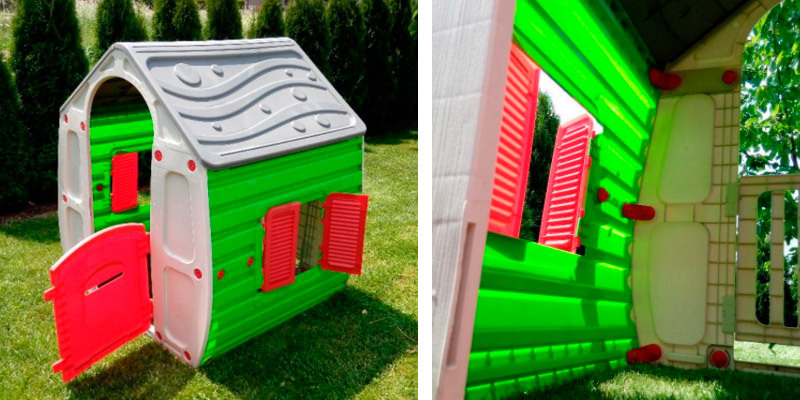 Doesn't really matter if you're looking to purchase a playhouse for your backyard or some room. 16 kg is just okay for an adult to move this model even two times a day. The construction of the roof ensures nearly no water leakage inside the house, enabling your kids to use it as a shelter for outdoor games when it's pouring. 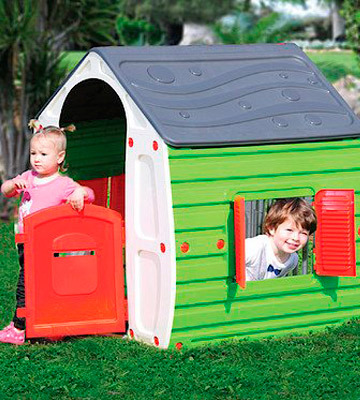 This wendy house is not too big to run around but spacious enough to accommodate two or three kids at a time. It has no floor so you can set it over almost any surface. The other good feature on the list of small details is the mail slot that promotes creative thinking of your children when they are playing games. Both doors are facing one another, enabling your kids to run through the house. 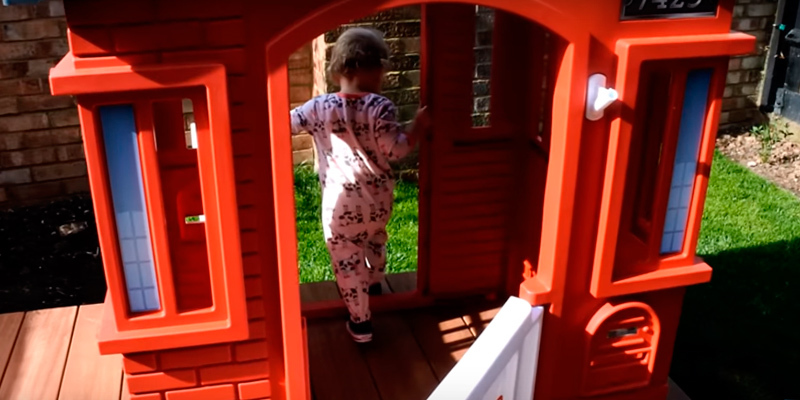 Furthermore, they will never fall over an unseen obstacle since this playhouse is properly lighted — it has windows to ensure enough sunlight comes in. And, of course, the shutters are openable. 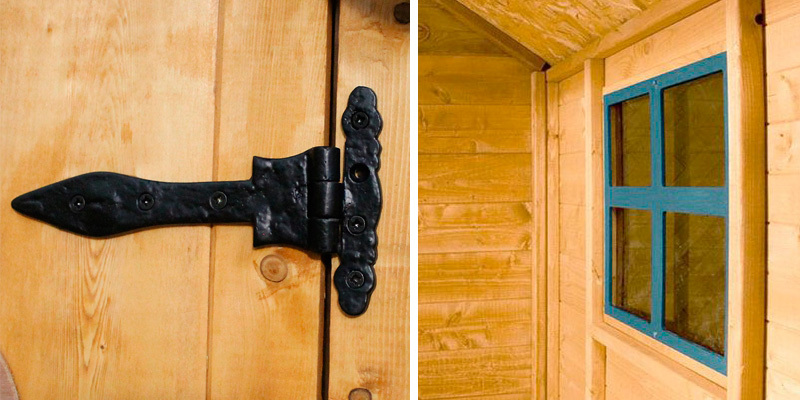 This playhouse resembles a welcoming cottage in a countryside with its exquisite exterior details. The curves on the wall imitate stone and wood planks, and you can also see an artificial skylight on the roof. When it comes to the interior, unlike some other wendy houses, this model has some decorative elements for games without compromising the inner space. The variety of colours picked to paint the walls, door, and the roof is calming and welcoming. The door is dyed in yellow colour with a bright hint to drag the attention of the kids and make them want to enter the house. It is not tall and rests on the base of the house to ensure it will never sag. The height of the door and window is perfect for small kids to peek out, which they really enjoy doing when their parents come around. It doesn't take much time or effort to assemble this house. You won't need any tools or anybody to help you since the pieces are interlocking to provide a sturdy connection. The disassembling process is as fast and easy as putting it together, enabling you to relocate the house and store it in a storeroom during the winter without sacrificing too much space. 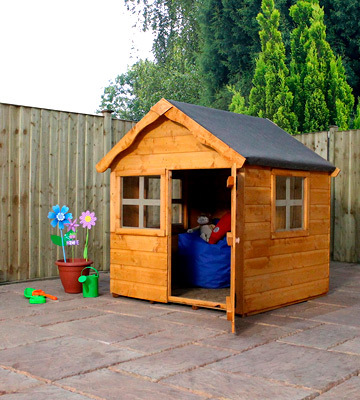 The gaps between the planks are wide enough to simplify the dismantling but not too wide to allow the water and the wind inside the playhouse if the weather conditions are not really pleasing. 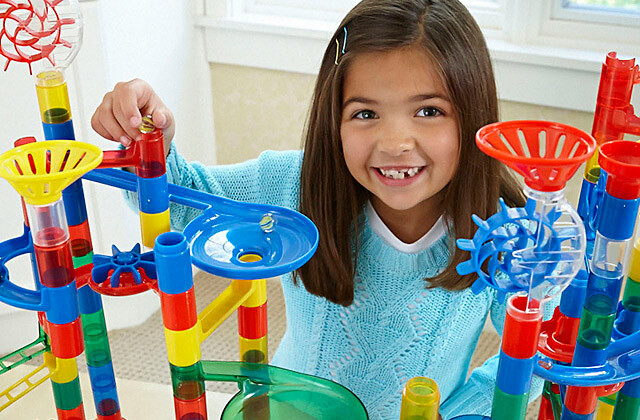 Openable doors and window shutters are never enough for active kids who value each small engaging detail in their toys. Thus, the manufacturers of this particular model have thought about providing an attachable table with two benches. Both benches and table withstand a load of up to 25 kg, which is enough even for a 6-year-old kid. Whether you have a barbecue or just invited some guests for a party, children will love to have some private space when dining. They would absolutely love to enjoy some foods served on their own table, enabling them to eat, drink, and small talk just like adults do. Plastic is also easy to clean so you shouldn't be worried about fat and sticky stains. 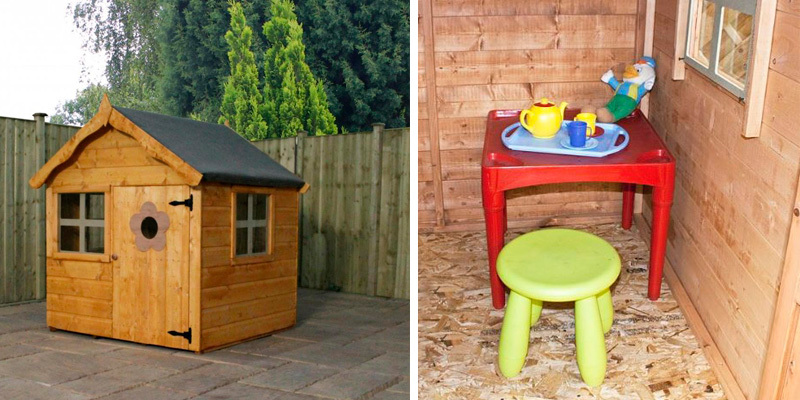 The benches and table take quite some space if you are going to use the playhouse indoors. However, you can simply put them inside the house. Actually, it is designed to provide enough space to accommodate two kids when the table and benches are placed inside. 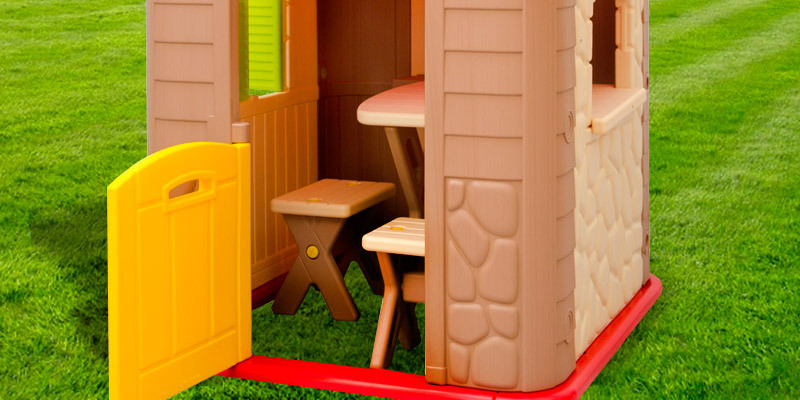 Your children won't be able to significantly shake or tilt the playhouse by pushing the table because the base is designed to provide stability. 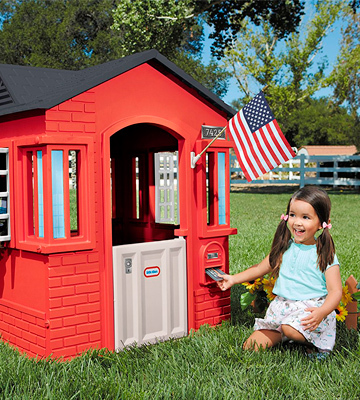 This popular playhouse model by Starplast is so far the smallest one this manufacturer produces. 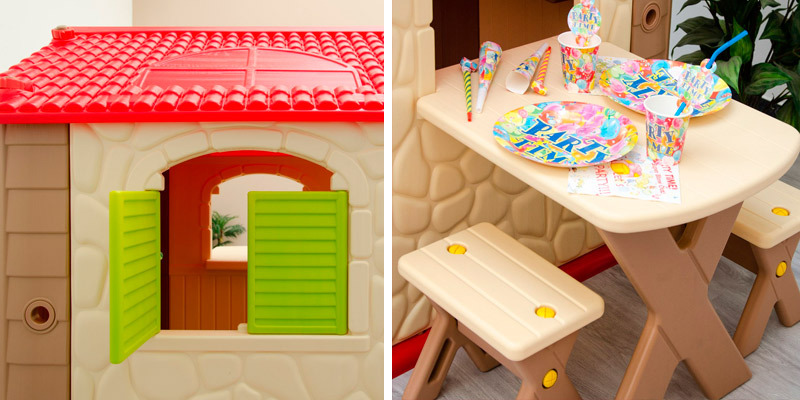 According to the manufacturer's recommendation, this particular house is suitable for 2-years-old kids and that's reasonable considering the tiny dimensions of this toy. It is also really lightweight (10 kg) and easy to move. It is one of the most childish looking products on the market — even the plastic screws are painted red. Despite the small dimensions, it is roomy enough inside for 2 kids. When both the gate and the door are opened, it becomes a perfect passage for many kids to run through. Simplicity is what parents are looking for when it comes to toys for children of a really small age. The construction of this house is designed to be sturdy and stable. The manufacturers have decided to achieve firmness and steadiness in the simplest way by providing numerous points of joint and, therefore, many plastic screws, which you can see on the pictures. Therefore, it is not seamless but it doesn't become hazardous for your children since all the elements have a smooth finish. Despite the number of elements, the assembly is still utterly easy. 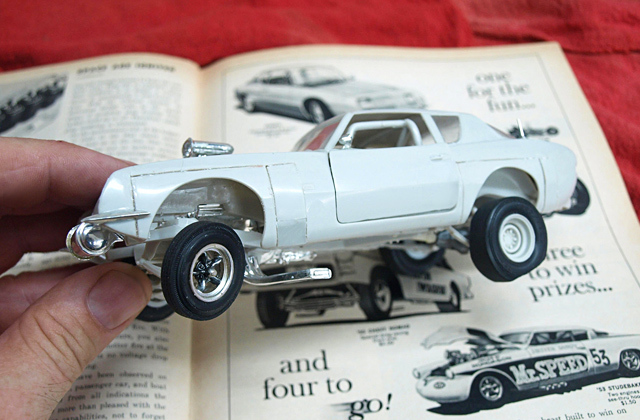 Putting it together is so intuitive that you won't really need a manual. 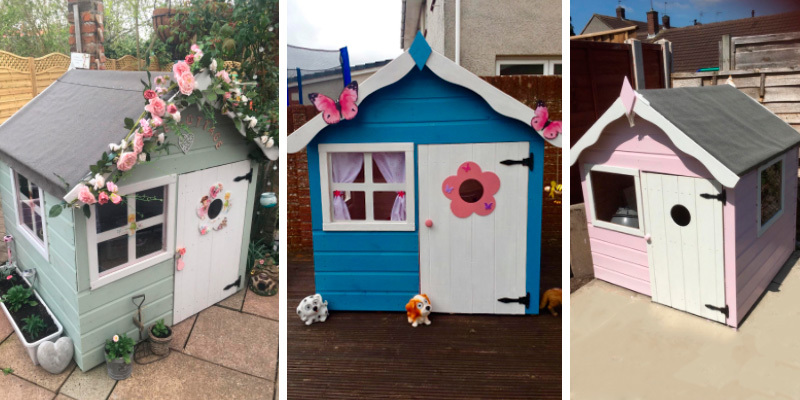 Considering the modest price of this playhouse, you will be likely to have some spare funds to purchase more entertaining toys for your child. The best thing to put into your consideration is to modify the wendy house into a playground by buying, say, a slide and a garden water table. 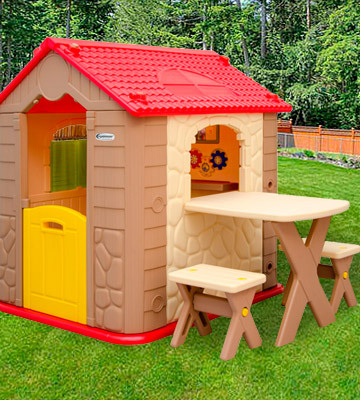 You can think about different combinations of toys, but the thing is that you can provide your child with more stuff for a price of a bigger playhouse. 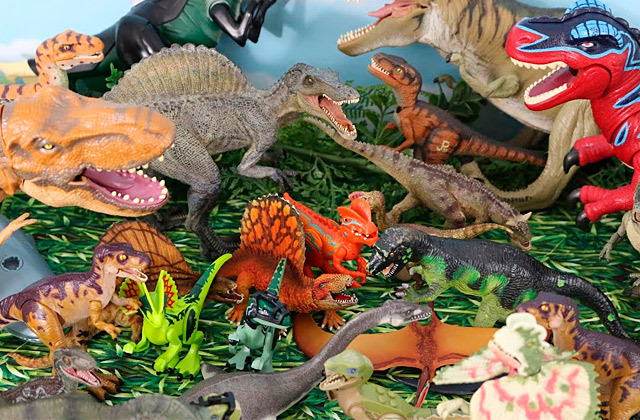 All these toys can be used indoors, enabling you to entertain your kid during any season. Nonetheless, it is up to you to think about the perfect combinations of playthings to expand the imagination of your children. It’s not “if”, it’s “when” your child begins to create a cosy private place to have fun, build a shelter, and have a rest. And when it happens, a playhouse will be the best gift ever. 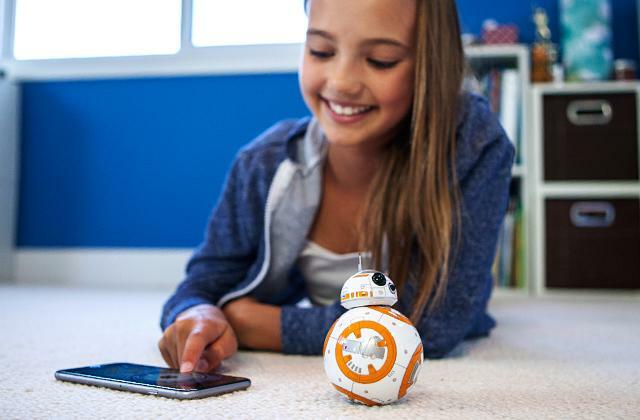 It can provide endless opportunity for imagination and entertainment! In this kind of house, your little one will be able to play "make believe" games with friends and explore the world around! With windows and doors, some playhouses look almost like real houses, and a vast number of interactive toys make them even more realistic. You can choose a house with a kitchen or bathroom, a storehouse, a castle, or even a pirate-ship playhouse. Just take your child’s preferences and age into account. 4. Colin Stone The Benefits of the Cardboard Playhouse, EzineArticles.com. September 1, 2016. 5. Dale Hrabi Why Children Need Playhouses, The Wall Street Journal. August 7, 2015. 6. Amanda Lehrman 10 Activities to Improve Your Toddler's Development, Parents. 7. John Hoffman 6 surprising brain-builders for preschoolers, Today's Parent. September 15, 2016. 8. Alex Brooks How to play with your toddler and actually have fun, kidspot. 9. How to help your toddler develop fine motor skills, Babycenter. 10. Amanda Morin Skill Development From Birth to Age 5, Understood.